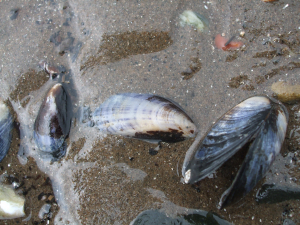 Observation - Mussel shells in wet sand - UK and Ireland. Description: A collection of mussel shells in wet sand. Mussel shells about 2-3 inches in length and black, blue colouring. A collection of mussel shells in wet sand. Mussel shells about 2-3 inches in length and black, blue colouring.